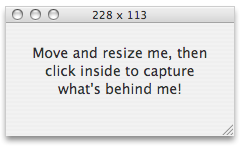 Capture Me is a flexible screen capture and recording utility for Mac OS X which features a floating capture window, several saving options, and resize ability. To use the program, drag and resize the floating window to cover the area you want to capture. Then click in the window to capture the screenshot. You can resize it, copy it to the clipboard, and save it in a variety of formats and locations. 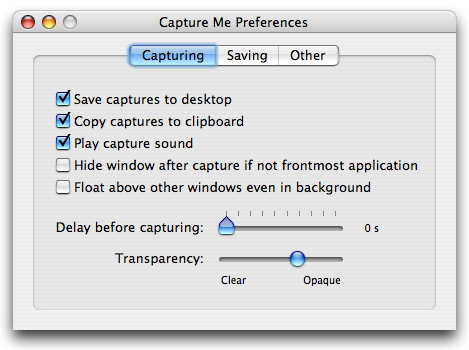 What advantage does CaptureMe hold over the built in OS X screencapture facility? For some tasks, the answer is simple - there is none - the built in screen shot is elegant and easy to use. However, there are occasions when it's nice to be able to choose what file format your capture saves in, copy it to the clipboard without holding down four keys at once, or resize it on the fly. It's also common to want to take successive shots of the exact same position on the screen without moving the capture region at all, or make all your captures the same size. These tasks are trivial with Capture Me, but difficult at best with the built in utilities. Another possible use is as a floating capture pad - see the comment below for an example of one user who does this. * Globally floating capture window. * Record short MPEG-4 QuickTime movies. * Fast screen captures (uses OpenGL). * Ability to down scale captures (proportionally or not). * Save as PNG, JPEG, JPEG 2000, TIFF, or GIFF. * Adjustable translucency of capture window. * Several ways to adjust the size and position of the capture (move the window, arrow keys, scroll wheel). * Barest beginnings of AppleScript support. * Written with Cocoa - native to Mac OS X. * Universal binary - Intel, PPC native.